Learn to play the music of your soul, using small hand drums and native flutes, to play simple, universal rhythms and a pentatonic scale. Start listening to your musical companions and find your own unique place in our ensemble. No experience necessary: Instruments provided, or bring your own (Am flutes if possible). 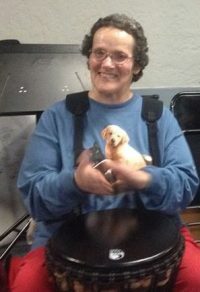 Kathryn has been an amateur musician close to 50 years. She sings and plays octave mandolin, Appalachian dulcimer, guitar, and most recently, world drums and Native American flute. She is currently a student of developmental community music, and a facilitator of drum and flute circles.